Although my first loves in the equine world are the Thoroughbred and the Arabian, two breeds that have many of the same characteristics, I also greatly admire the American Saddlebred. The American Saddlebred is as much “America’s Horse” as is the Quarter Horse. Long named the Peacock of the Show ring, the Saddlebred has always been a thrill to watch. My first opportunities to watch them in action occurred at the old Madison Square Garden in the ‘60s. Later on, after moving to Missouri, I became more familiar with them in their show ring setting. 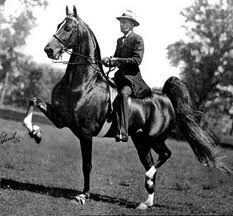 Sadly the American Saddlebred has not been one of the more kindly treated breeds in our history. And while the Saddlebred, as a registered breed, has been developed for the show ring from the beginning, it is far more versatile than it may appear. I grew up in a riding program on Long Island that was based on a combination of Chamberlin and Littauer. I just want to be clear that I didn’t grow up riding saddle seat. Several of the horses in this lesson program were American Saddlebreds and I rode them frequently. They were solid over jumps, had lovely gaits and everyone of them was beautiful with an outstanding disposition. I think the Saddlebred disposition is one of it’s most awesome qualities. One of the horses, we called him Gingerbread, was ridden to the Long Island Professional Horseman’s Association Jumper of the Year multiple times by his owner. Gingerbread was also a mount at summer camp and in the weekly riding lessons. And while doing all of this, Gingerbread took another rider through try outs for the United States Equestrian Team. Try outs with the team were the basis of selection at that time. Looking through the 1908 Register of the American Saddle- Horse Breeder’s Association I was interested in finding out more about this breed than what I’d learned as a child. Towards the end of the 18th century an easy gaited type of horse was developing and it was referred to as the American Horse. Breeders had been combining Thoroughbreds with the American Horse and pretty soon a clear type began to emerge. In the 1880s breeders began expressing interest in forming an organization for their horses and the American Saddle-Horse Breeder’s Association was formed in Louisville, Kentucky on April 7, 1891. Initial registry allowed horses that could perform the five gaits: walk, trot, rack, canter and either a running walk, fox trot, or slow gait. It also allowed the horse whose sire, grandsire, dam or grand dam was of the strains of blood recognized by the association. Mares that produced 2 or more performers and stallions that produced 5 or more performers could also be registered. And of course progeny of a horse that was already registered could be registered as well. Registration, or entry as it was referred to, was $1 for members and $2 for non members with transfers costing fifty cents each. During the first register colors of horses were referred to with descriptions such as “satin” black, “cherry” red and dark dappled steel gray. By the time the third and fourth registries came out, geldings could be registered on the merit of five gaits. Also, the progeny of mares recorded in the American Stud Book and by registered Saddle-Horse stallions were accepted into the registry. The purpose of the American Stud book was to record Thoroughbreds. Book for Thoroughbreds began in 1868 and in 1898, two years after the Jockey Club was formed, the Jockey Club took it over. Fifteen horses were originally designated as foundation bloodlines in the American Saddle-Horse Association Registry and three more were added in successive years. There was a variety of blood in these foundation horses ranging from Standardbred, Morgan, Thoroughbred and a few other interesting breeds. By 1908 the association had determined that there was only one horse worthy of recognition as the foundation of the American Saddle -Horse and that was a horse named Denmark, a brown 16 hand stallion, foaled in 1839. A little searching through Denmark’s pedigree revealed horses such as, Eclipse (a great grandson of Godolphin Arabian and a Great Great Grandson of the Darley Arabian), Symes Wildair (another Great Grandson of Godolphin Arabian), and many more with crosses to Leedes Arabian, Darley Arabian, Godolphin Arabian, and Byerly Turk. Even though I learned about three foundation horses of the Thoroughbred breed as a child (Darley Arabian, Godolphin Arabian and Byerly Turk) it was fun to see how they effected the Saddlebred Horse. prepotency. Two of Denmark’s off spring, Gaines’ Denmark and John Willard, both stallions, served courageously in the Civil war in Gen. John Hunt Morgan’s command, known as Morgan’s Raiders. The American Saddle Horse was also ridden by Lee on Traveller, Grant on Cincinnati, Sherman rode Lexington, and Stonewall Jackson rode Little Sorrell. 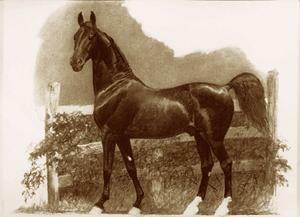 Grant’s horse, Cincinnati was said to have stood 17 hands tall and was recorded as a Thoroughbred. The American-Saddle horse was used in great numbers by the Confederate Cavalry during the Civil War and was also used by troops during the Mexican wars. The influence of the American Saddle-Horse continued after the Civil War, as America expanded carrying settlers and explorers throughout the West. It’s popularity also grew because horse shows were a huge source of entertainment for the public. Rivalry between the American Saddle-Horse Breeders in Kentucky and Missouri became pretty fierce and Missourians adopted the slogan, “If Kentucky made the Saddle Horse, then Missouri made him better”. In 1908 fifty five and a half percent of all the American Saddle-Horses that were recorded in the Register had a direct male line to the Thoroughbred Denmark. And in 1991, at the ASHA Centennial, Harrison Chief was designated a foundation sire along with Denmark. Harrison Chief was well endowed with Thoroughbred blood through Messenger, multiple times in his bloodlines. Messenger sired good runners but was exceptional at siring horses who could trot at blazing speed. 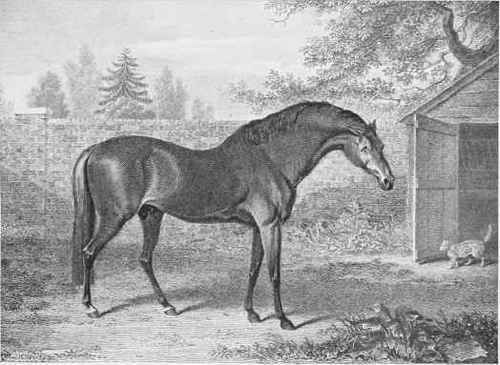 Messenger was recognized as the most important foundation of the Standardbred breed. 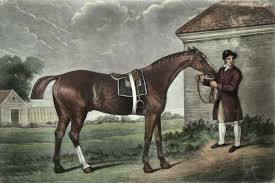 Messenger was a great great grandson of Godolphin Arabian two times and also carried the blood of Darley Arabian, Leedes Arabian, and Byerly Turk. The American Saddle-Horse has only recently been referred to as the American Saddlebred, none the less this breed of horse played a big part in the settling, growth, development and leisure activities of our Nation. 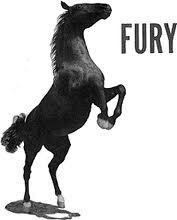 Not only has the American Saddlebred entertained us in the show ring, we have watched the horse in the movies and on TV as they took lead roles in My Friend Flicka, Fury and versions of National Velvet and Black Beauty. The horse used in Gone With The WInd that Ashley WIlkes rode off to war was an American Saddlebred named Anacacho Rebel. And who could forget Bamboo Harvester, the American Saddlebred cross that played everyone’s favorite talking horse, Mr. Ed. Over the years we’ve watched them in parades and movies, and of course, the gaited show ring. They are beautiful when hitched for combined driving and are lovely in the dressage arena. They are bold and brave enough for cross country riding too. Most of the time the Saddlebred is easy to handle and care for because their dispositions are naturally forgiving and stable, especially when they’re treated well. I guess they pretty naturally fall in line with my favorite breeds, the Thoroughbred and the Arabian because they are, after all greatly influenced by both.